I was born and raised in Sri Lanka, speaking Sinhalese. English is my second language and I’m fluent in German, as well. Switzerland is my current home, where I live with my husband, daughter, and all my fictional friends. My best friends are fellow authors because they understand my passion for the written word, The Hunger Games, and power-wielding female characters in general. I love characters with a bit of humor and a little dorkiness, so I can giggle while reading. Basically, if it has anything to do with books, I’m interested in it. I happily refer to myself as a nerd who has an extensive library of paperbacks. 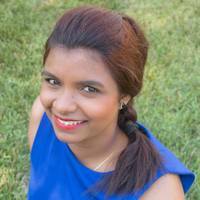 Follow Komali on her author pages to find out more about her next adventure in Dawn's world and many more. .
Website: www.kom I was born and raised in Sri Lanka, speaking Sinhalese. English is my second language and I’m fluent in German, as well. Switzerland is my current home, where I live with my husband, daughter, and all my fictional friends. My best friends are fellow authors because they understand my passion for the written word, The Hunger Games, and power-wielding female characters in general. To ask Komali da Silva questions, please sign up. Komali da Silva I watch a movie or I read a book I love. Komali da Silva I get to meet and chat with a lot of amazing people. I would have never met them if I weren't a writer. Komali Silva voted for Wild Reckless (Harper Boys, #1) as Best Young Adult Fiction in the Final Round of the 2015 Goodreads Choice Awards. "Firstly, I start of by telling you all.. THIS BOOK IS FREE TO DOWNLOAD ON EREADERS WOW! What a hilarious and dark read. I found my self SHOUTING out with laughter so many times whilst reading this story. We’d love your help. Let us know what’s wrong with this preview of Secrets in Phoenix by Gabriella Lepore. We’d love your help. Let us know what’s wrong with this preview of Gifted by Liz Long. We’d love your help. Let us know what’s wrong with this preview of Hunted by Liz Long.